Ear Tubes or Tubes in the Ears - Why Does My Child Need Them? If your doctor has told you that your child needs tubes in their ears or ear tubes, it can be a scary thing to hear. When your child has an ear infection, it can be viral or bacterial. Viral infections tend to go away by themselves after time, but bacterial infections need antibiotics. Most ENTs will follow these guidelines for treating ear infections, but when infections become too frequent, or chronic, a procedure called tympanostomy is the next step. ENT surgeons place ear tubes, or perform a tympanostomy, once children (or adults) get around 5 infections in 6 months to a year. Doctors also sometimes prescribe it if there is a lot of fluid buildup, pain, or hearing loss. The surgeon places tubes through the eardrum to create more space and air in the middle ear. This helps to prevent ear infections because the space stays drier (less inhabitable for viruses and bacteria). Children are more susceptible to ear infections because the eustacian tubes from the ear to nose is shorter and fills up with fluid easier. What Do Ear Tubes Look Like? Ear tubes are very small tubes that doctors insert through the tympanic membrane to help the middle ear. They are also called myringotomy tubes, ventilation tubes, or pressure equalization tubes. A patient can have either short-term ear tubes or long-term ear tubes. Short-terms tubes are most common for children. They stay in the ears for anywhere from 6 months up to 2 years and then usually come out on their own. Long-term tubes have sections that secure them inside the ears for a longer time. They still sometimes fall out on their own or a doctor can remove them. They work best for those who have especially chronic ear infections over long periods of time. 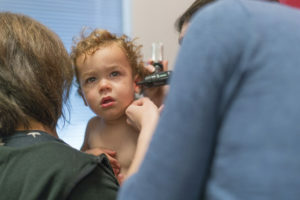 How Do You Know if Your Child Might Need Ear Tubes? If you have questions about ear tubes or your child getting tubes in their ears, please contact our office at Palm Beach Sinus Doctors right away. Our friendly staff will be more than happy to help.